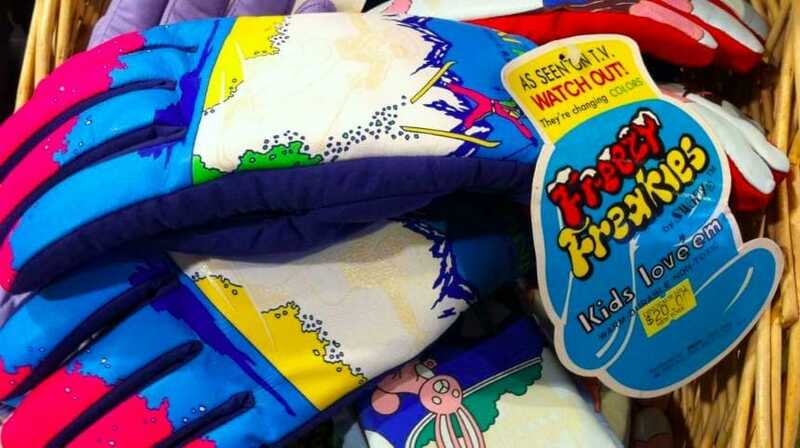 Those of us old enough to remember the early ‘80s might recall the winter fashion craze known as the Freezy Freakies. These were gloves designed by ski wear company Swany America that magically changed color when they were introduced to cold temperatures. The gloves appealed to thousands of kids across America thanks to the cool designs such as fighter planes, castles, robots, and love hearts. The gloves came in a variety of colors and parents in the early ‘80s were no doubt under pressure from their children to purchase more than just one pair of the color-changing gloves. The gloves would change color once in temperatures below 40°F. Once below this temperature, an image would present itself on the back of the gloves, to the delight of many children in the snowy regions of America. Originally there were over 30 original designs that stemmed all the way back to 1980. Skillfully marketed, Swany America launched a variety of glove designs that appealed to all kinds of different children. They had enough designs to keep both girls and boys happy and were shipping 300,000 pairs of the gloves every year at the peak of their popularity. The gloves were made using special thermochromic ink. This dye was temperature sensitive and would change when placed in the right temperature conditions. The dye had been used before in other products such as mood rings and heat sensitive food packaging that can expose whether a food product had been subjected to high temperatures. Swany America obtained the license to use the ink from a Japanese pen company, Pilot, and thought it would work well with their products. Amazingly, the gloves only retailed at $13 which is probably another reason why they became such a hit, they were affordable. What if it wasn’t cold out? It was not uncommon to find kid’s gloves locked in the freezer so they would change color. The company had sold the gloves at trade shows using ice cubes to demonstrate the color-changing ability of them. Something the kids either heard about or they simply figured out they could shove them in the freezer to make them colder themselves. The gloves had become such a huge success, and at this point, the company decided to start selling jackets and other products with the same technology in. Selling the Freakies had proved such a hit that the company considered changing their name to match the gloves. It turns out that like most kid’s trends, they soon burn out and interest fades. The company found that their sales started to drop and by the ‘90s the interest in the color-changing gloves and attire had more or less disappeared. In the end, the color-changing clothes were replaced by color-changing mugs and other novelty items, something Swany America was not interested pursuing. In an attempt to cash in on the nostalgia, the Freakies have been revived thanks to a crowdfunding campaign. However, they cost a staggering 34 dollars now, but they come in adult sizes so those kids that had them in the ‘80s can be reunited with their long-lost gloves. The crowdfunded company, Buffoonery, have committed to making kids gloves to allow parents and kids to have matching gloves. That was the story of the Freezy Freakie craze from the’80s. If the story has got you nostalgic for your old pair of gloves then you’re in luck and can find a new pair that will fit you now as an adult.